Summer reading group, part of Data Science Lab at ECpE Department, Iowa State University. © 2017. This site uses Lanyon. We are group of members of Data Science Lab at Iowa State University. 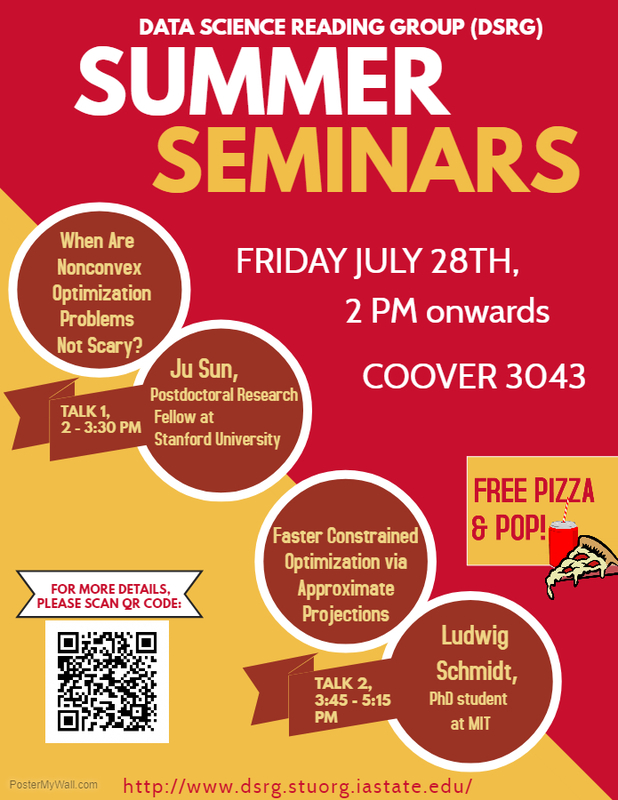 We get together to read and understand the very recent papers related to Theoretical and algorithmic aspects of nonlinear parameter estimation and deep learning. We meet twice a week. Please see our Reading list and Schedule page for more details. In our 13th meet on Tuesday, Praneeth presented the paper titled [Towards Understanding the Dynamics of Generative Adversarial Networks](https://arxiv.org/abs/1706.09884. Notes for the meeting are available here. In our 12th meet on Tuesday, Gauri presented the paper titled Towards Understanding the Invertibility of Convolutional Neural Networks. Notes for the meeting will be posted here once available. In our 9th meet on Tuesday, Thanh presented the paper titled Maximal Sparsity with Deep Networks?